I am always most nervous before the first race of a major championships, and this time it was the sprint qualifier first. I was also confident in my ability to produce a good race and qualify comfortably though. My warm up was quite interesting as I got stung by a wasp, and then taking some time to sort myself out, I almost missed my start and had to sprint to the start line. Despite that I composed myself and ran pretty well. I was cautious to take my time and pick out good routes, not taking any risks. I got my feet wet a couple of times by not being aggresive, but that was about the worst thing in the first half of the course. Right after the spectator control, I ran straight into a branch of a tree, almost impaling myself and knocking all the wind out of me. After a few seconds wondering if I was still alive, I carried on a little sluggishly. I managed to complete the course but I was in a fair bit of pain. Luckily no lasting damage and I was fine by the next morning. I finished 6th in my heat, which is my best WOC qualification. Results and splits are all available here. My only real disappointment of the championships is the fact that I failed so badly in the middle distance. I missed the first control, and failed to relocate. When eventually I found the first control, I had lost 4 minutes and had no chance of making the final. I moved out of qualifier mode, and into panic must run as fast as possible mode for the rest of the course and proceeded to make a lot more mistakes. I also got quite a few fastest splits on the controls I did spike, but I finished well outside the top 15. I was pretty gutted with my performance, and to prove to myself that I could do it, I re-ran the course the next day 5 minutes quicker without pushing it - just goes to show that you just need a clean steady run in the qualifiers, and I will be better next year. After the middle disappointment, I had plenty of time to recover and prepare for the relay. I have been running a few first legs over the last year, and I was really keen to make the GB relay team. I stood on the start line feeling confident in my ability, and the ability of Jon and Jamie after me to get a top result. I started steadily, and was completely stupid at the first control, mis-reading my code and running off, before coming back again. Despite that, I managed to be in the lead at the 3rd control (thanks to a short early gaffle). I led through my 4 - 8, where I saw a large pack of runners just behind me. On the long leg to 9 most of them caught me, and I took what was probably a stupid route into the control (down along the marshy gully rather than up and round), and I dropped into the middle of the pack (but most had had a longer gaffle earlier on - seems in a relay its a real disadvantage to have short early gaffle, especially on first leg, and more so if you have a longer gaffle later on). Through 10, 11, 12 I was running with a large group, although people were splitting to go to different controls. I missed 11 slightly, just overshooting in the circle, but it seemed like everyone on my gaffle did the same, and we were all running together up the hill to 12. After that, I just ran in a pack through 12 - 15. I had a longer gaffle to 16 and lost Oberg and Gonon who were just in front of me. Then disaster just before 19, my SI card flicked off my hand and I had to go hunt for it. Luckily the forest was open and I found it fairly easily. Then I was so tired for the last few hundred metres. I handed over to JD in 15th, about 2.50 down on the leaders. Actually my worst performance result-wise all year on first leg, but I felt like my speed was good and my technique was good. I lost a little time in the gullies, and I was really tired from all the climbing, but I didn't lose more than minute. I must have lost some time on running speed in the last loop, and also some seconds looking for my SI card. Anyway, Jon and Jamie ran pretty good and we finished 7th, some 2 minutes off the podium. A creditable result, but we were all hoping (and maybe expecting) something even better. 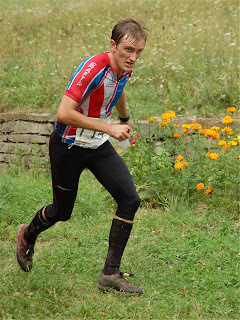 After the race I got some really bad stomach cramps, some diarrhoea and really struggled to eat or drink anything. It was about 6 hours before I could really eat anything, and that went straight through me. At that point the sprint final was looking a bit dubious. I actually woke up feeling a lot better, nervous and empty, but generally pretty good. I still had some diarrhoea, and warming up I felt like I didn't have a huge amount of energy. Still, I felt good and confident in my technique at least. As I was on the call up, I heard Wingstedt finishing and answering a few questions, so I knew a little of what to expect. I started steadily and noticed the first couple of controls looked a little tricky. I navigated carefully to the 1st, and didn't really understand the 2nd. The green 'hedges' turned out to be vines or something, and they werent very distinct. It was only after I had run past and looking back and around that I saw the control. 3 was an interested route choice, and I tried to minimise the climb and find the easiest way into the control. Perhaps I should have run north of the building along the path, but the forest floor was fairly level and easy running. After a slightly slow start, I got a really good split here. 4 was straightforwards, although looking ahead, I knew there were a couple of key route choices coming up. I had decided to try and conserve height as much as possible, and chose a route to 5 that looked to have a good way into the control as well as not having too much climb. It turned out that a lot of the small paths were really overgrown, and there was no chance to run and read the map. My route was a little slow compared to the route to the west and I lost around 15 seconds. 6 was potentially quite tricky, and I was careful with my direction through the bushy forest. 7 seemed to be another crux route choice, and again faced with a 50-50 decision, I opted for the slightly longer but flatter route to the west of the large building. It also offered some better surfaces for running and looking ahead at the course. I think it was a good decision for me and I got a really good split time (4th). Number 8 I didn't really see a route to the north out of 7, so I was looking at over or round the hill to the right. Again, feeling weak on the hill, I chose round, but this time I think it was a poor decision, and I lost arund 10 seconds here. My route was just too far off the line. I saw my 1 minute man, Leif Bader, here, and I ran 9 and 10 really hard to catch him. I passed him on the hill down to 12, and I knew I was having a good race. Control 13 seems to have caught out more people than any other, including me. I came out of 12 too far right and ended up 20-30m NE of the control. As soon as I hit the small path I stopped, relocated, and ended up losing only around 5-10 seconds. Martin Johansson did the same but lost around 30 seconds and a gold medal. 14 was easy, and 15 offered an interesting last route choice. I was obviously getting tired as I lost a couple of seconds on the climb. I ran hard into the finish though, and overtook Nordberg by less than a second on the line. As I finished, I was 3rd, and I knew that it was good enough for top 20 for sure, and maybe around 10th if I was lucky. I am really happy with 12th place, and while I can find 2 route choice errors (25 seconds maybe), and 2 small mistake (10-15 seconds), I am really happy with my race technically. Physically I felt weak on the hills, and I will work on that for next year. I am back in England now after a weeks holiday in Odessa on the Black Sea. This weekend I am attending the British Athletes Commission annual conference in London, the on Tuesday I am going for my second WOC 2008 training camp in Czech Republic with the British team. When I get back from that, I will spend a last few days with my parents before moving permanently to Stockholm on the 19th.